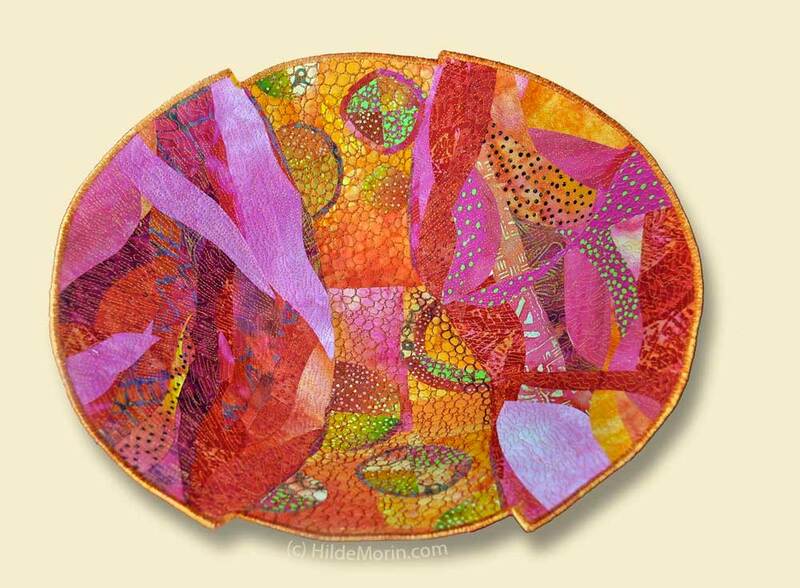 Portland Oregon (by way of Venezuela) fiber artist, Hilde Van de Walle Morin, created this stunning and colorful quilted 17″ bowl entitled “Blood Orange.” While the bowl itself forms a mandala-like shape, Hilde also includes circular designs within the structure of the bowl. And check out her color combinations, a beautiful balance of lights and darks. I find inspiration in both, natural and in architectural scenes, having a particular interest in weathered structures and formations. I enjoy extremes, neutral and vivid colors, clean and cluttered lines, chaotic and planned compositions. In my natural scenes I represent reality by simplifying or suggesting it through either abstract or primitive designs and through the use of curved piecing techniques. … My approach includes the creation of a first layer of improvised pieced fabric with the addition of a second layer of texture through extensive thread work and surface design. My work is influenced by travels, nature walks and by my multi-cultural background. View all the fabulous ways she expresses her fabric art via her online galley. Hilde’s bowl inspires us to explore our creativity by letting it just naturally unfold as we take one step at a time. Rather than planning out every detail and process ahead of time, see what happens when we start with just a simple idea and then let “It” reveal to us what wants to happen next.